Whether you are a professional carpenter, someone who likes to dabble in projects such as furniture building, or a person who enjoys doing household repairs, a circular saw is a great investment. You want to make sure to get a good circular saw that will see your projects through to the end while ensuring your safety in the process. It is important to consider the blade type, the cutting features, the power features, and the safety features of every circular saw that you are considering purchasing. There may also be additional features like a dust blower or a laser line that you may deem necessary for the project at hand. With so many different options available, considering all of the features and deciding which circular saw is best for you can be a challenge. We have done the research for you and narrowed it down to these circular saws as the top ten available on the market today. Makita is a worldwide manufacturer of strong industrial strength power tools that are known to be crafted from light weight materials. 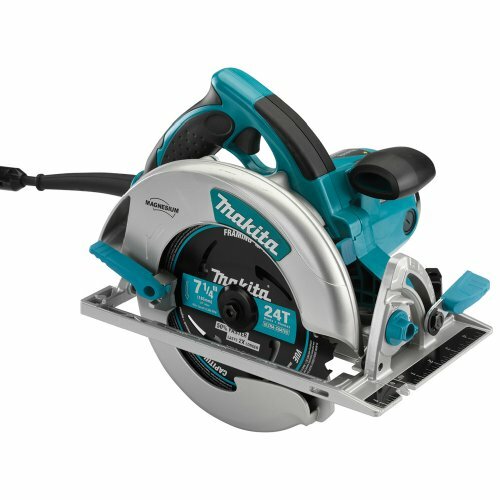 The Makita Magnesium 5007MGA is a 7 ¾ inch saw that features a built in motor that delivers 5,800 RPM. The ten pound saw has a large cutting capacity of 2 ½ inches at 90 degrees. The bevel capacity is 56 degrees, which means that any angle below that can be used to cut. Additionally, the bevel stops at 22.5 degrees and 56 degrees to allow for a quick adjustment for these two angles. This circular saw features a stop brake, LED lights for illumination, and rubber levers to provide quick one handed adjustment options. The advanced tooth designed blade is ultra coated to reduce heat build-up, and a built-in dust remover helps to keep your work space clean. 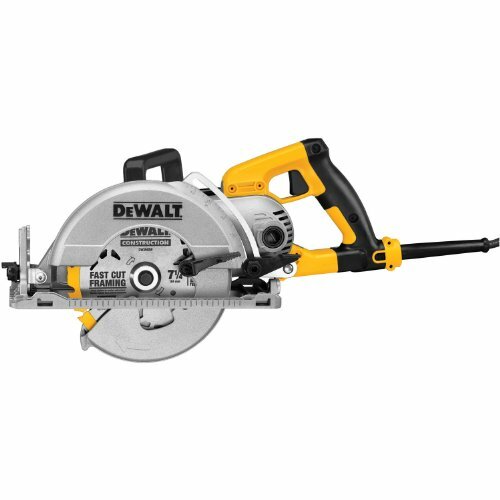 DeWALT is a leading manufacturer when it comes to the world of power tools, and the DWE575SB is a circular saw that features a great design. 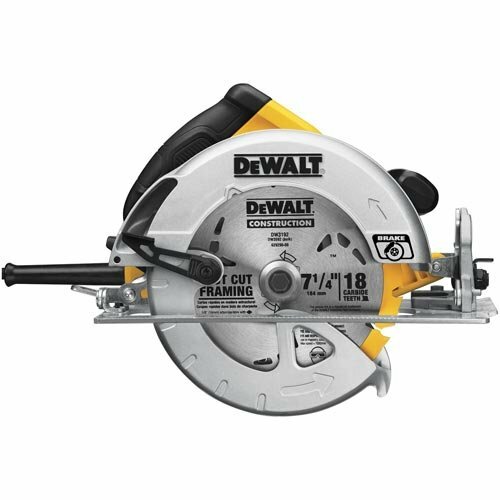 This 7 ¼ inch circular saw, which only weights about eight pounds, comes in as the lightest and the easiest saw to maneuver on our list. The saw has a 2 9/16 inch cutting capacity that features a 57 degree bevel. The bevel has stops at the 22.5 inch mark and the 45 degree indent for ease of adjustment. DeWALT has also added several additional safety features to this model. It has a ToughCord cord that is designed to offer three times the protection of a normal power cord. It also features an electric break that allows the blade to stop a few seconds after it is triggered. The SKIL 5680 is a power tool that truly lives up to the SKIL name. The 7 ¼ inch saw is a top of the line saw that comes with two beam lasers that are designed to help you make accurate cuts. At a 90 degree angle the saw is capable of making cuts that are 2 7/16 inches deep. It has the capability of adjusting the bevel to a maximum of 51 degrees with a bevel stop right in the middle at the 45 degree mark. The saw blade can be removed by a simple hex wrench, which can be stored on the tool itself. The saw is equipped with a safety lock to prevent accidental starts as well as an anti-snag guard for additional protection. The power cord on this model is only six feet long, but the dust remover is one of the best for keeping your blade and cutting line clear. Bosch has been a known name for top of the line power tools for more than a century. 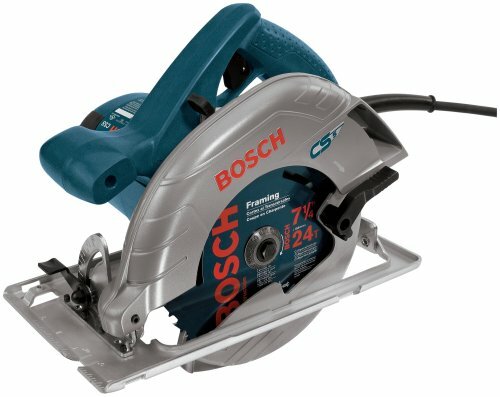 The Bosch CS5 continues to live up to the name with the cutting capability of this circular saw. The 7 ¼ inch cordless saw is equipped with a 15 amp motor that delivers 6200 RPM of raw power. The saw has a bevel capacity of 56 degrees; however this model does not have bevel stops to make blade adjustments quick and easy. The left blade design and the dust removal aspect of this saw work together to assure that your line of sight is clear. In addition, the blade features a lower anti-snag guard that allows cuts to be made without the worry of advancing the guard itself. Milwaukee power tools have a reputation for a superior build that is designed to last a long time. The Milwaukee 6390-21 is no different, and with the impressive five year warranty offered by the company upon purchase, it is clear that the company backs its products. 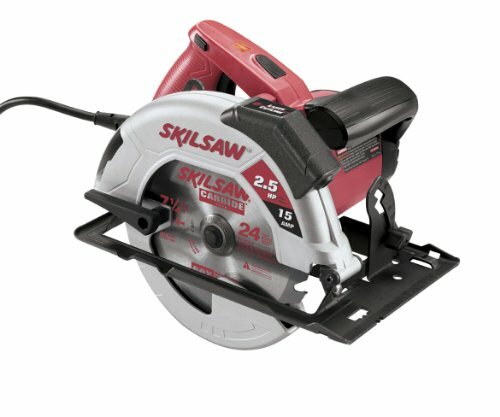 The 7 ¼ inch circular saw features a compact design that is lightweight and easy to handle. This saw has bevel capabilities up to 50 degrees; but unfortunately, this saw does not have bevel stops. A notable feature of the Milwaukee 6390-21 is the tilt lock handle that gives you eight adjustable positions designed to give you the perfect grip, comfort, and maneuverability. Blade changes can be a cinch with the one touch spindle lock. In addition, there is also a safety lock on the power chord. DeWALT once again appears on our list with the DWS535, which shows exactly how dependable the brand can be. 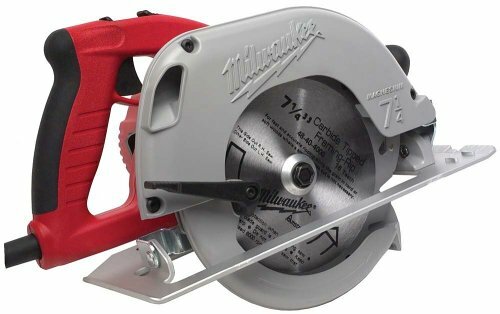 The 7 ¼ inch saw is designed to be easy to maneuver and is crafted from magnesium to be lightweight and comfortable to use. The 13 pound circular saw can cut at a 90 degree angle up to 2 7/16 inches deep with a bevel of up to 53 degrees. To save time, DeWALT has added bevel stops at 22.5 and 45 degrees. In addition, the DWS535 has an extra wide saw hook that allows you to cut materials that are up to 2 ½ inches in width. Changing blades is made simple with the spindle lock, and the ToughCord cord protection system is designed to add four times the protection of a traditional cord. RIDGID has been among the leading manufacturers of power tools and hand tools for decades. 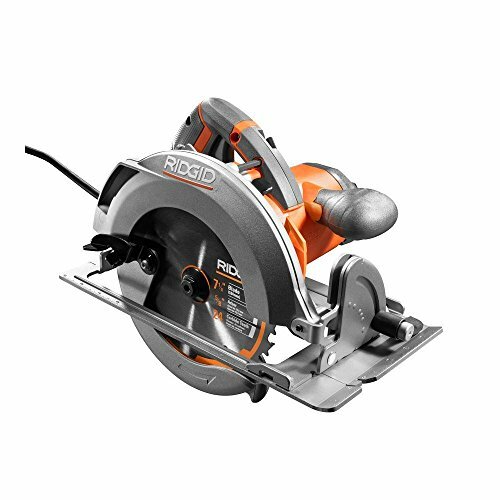 The RIDGID R3205 is a 7 ¼ inch circular saw that is built to have a high level of power while still being comfortable and easy to use. This saw has a maximum cutting depth of 2 3/8 inches and a bevel of up to 56 degrees. The bevel has six positive stops at common angles to allow for quick adjustments. In addition, the saw comes with a ten foot power cord as well as a dust chute and a built-in blower that will keep the area you are cutting free from debris. 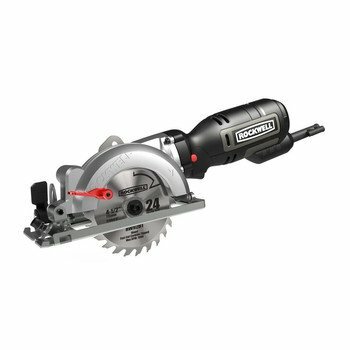 The Rockwell RK3440K is slightly different from the rest of the saws on our list as it is a miniature circular saw. This difference means that the saw can be lighter in weight while still maintaining the power it needs to cut through about an inch of material. The saw is designed to help you make perfect cuts with Rockwell’s Laser Guide technology, which allows you to plan the exact cuts you need to make. In addition, plunge cut indicators help you determine exactly where the blade will cut into the material. Since the RK3440K is designed to be lightweight and versatile, it comes with a carbide-tipped blade for cutting wood, a HHS blade for cutting aluminum, and a diamond blade for cutting through ceramic. 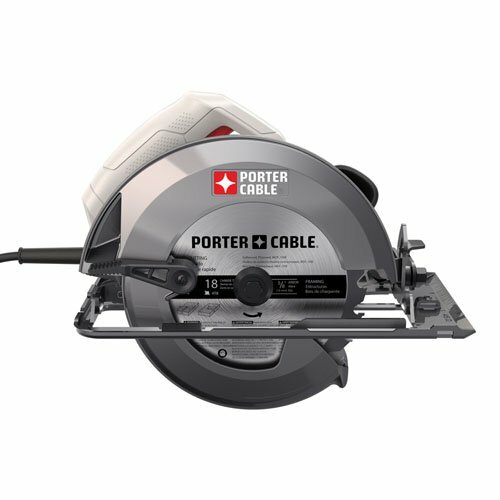 The Porter-Cable PC15TCS is a great 7 ¼ inch circular saw designed to make smooth, clean cuts. This lightweight saw only weighs about nine pounds, but it has a 5600 RPM motor that is capable of delivering all of the power you want your new circular saw to have. It is capable of making a bevel cut at an angle of 55 degrees, and the saw itself has convenient bevel stops at 22.5 degrees and 45 degrees. The PC15TCS comes complete with an easy to reach cut lever as well as a dust blower to keep the cutting visibility clear. The saw also has a lower guard lip that helps prevent snags and hang-ups during compound angle cuts. In addition, the power cord is an amazing ten feet long, and the spindle lock makes switching blades a cinch. 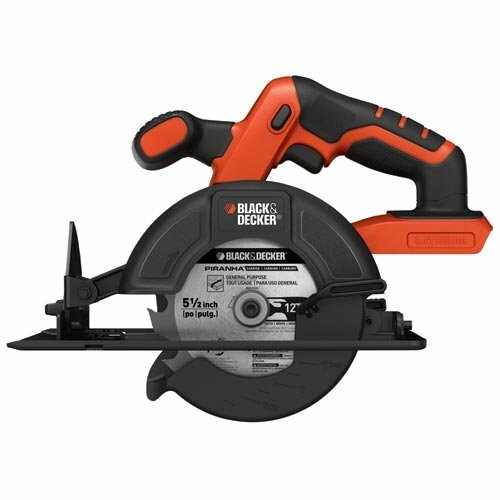 Black and Decker has been a well known name when it comes to power tools and hand tools for over a century, and when it comes to quality, the BDCCS20CB stays true to the name we have come to trust over the years. Weighing in at only six pounds, the compact design of this circular saw makes it lightweight and easy to use. Even though this circular saw is a cordless model, it features a high torque motor capable of getting most jobs done. The 5 ½ inch blade is designed to make clean cuts without much effort, and the bevel can be adjusted without the use of tools to 45 degrees and 90 degrees.